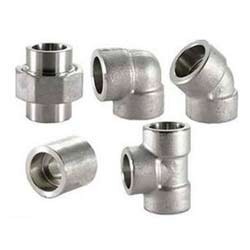 Our esteemed clients can avail a wide range of high quality Forged Fittings to the customers. These fittings are widely appreciated by the clients for their durable standards, dimensional accuracy and corrosion resistance. Moreover, we make sure to check their flawlessness on certain quality parameters, before their dispatch to the clients' end. In our range, we offer Forged Fittings: 15 NB to 100 NB in 3000 LBS, 6000 LBS, 9000 LBS available with NACE MR 01-75 Form of Forged Pipe Fittings, Elbow 45 Degree & 90 Degree, Full Couplings, Cross Couplings, Half Couplings, Tees, Caps and others. 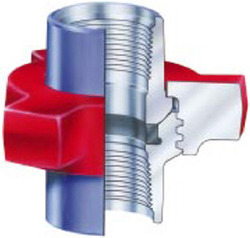 Superior Steel offers a comprehensive range of Hammer Unions. Each union is thoroughly inspected to ensure long, dependable service in the most extreme conditions. 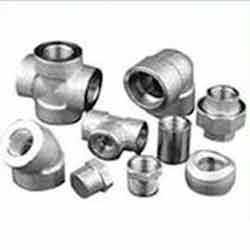 We offer a wide range of Stainless Steel Forged Fittings that are widely used in various industries for different purposes. Our team of technical experts has manufactured these Stainless Steel Forged Fittings from superior quality stainless steel. These are available in various grades such as ASTM A 403 WPB/ A 182 F 304, 304L, 316, 316l, 317, 310 and 310S. Our ranges of fittings are tested on various conditions and appreciated for its features like dimensional accuracy, static pressure, corrosion resistance and tolerance. We are well known manufacturer, exporter and trader of the finest quality Duplex Forged Fittings. These are manufactured using top quality materials that are procured from reliable vendors in the market. These flanges are available with us in an array of shapes and sizes, which is offered to our customers at industry leading prices. Our ranges of products are appreciated for its acknowledged for its features like durability and sturdy construction. These are available at economical prices in the market. We are instrumental in offering a high quality range of Alloy 20 Forged Fittings to the esteemed customers. These Alloy 20 UNS N0.8020 Fittings are made available to the clients in a variety of shapes, sizes, dimensions and other specifications. Moreover, we provide these products to the clients as per the exact details specified by them. We bring forth an exclusive range of this Alloy Steel Forged Fittings which is well known for its parameters like durability and high performance. We manufacture using top quality materials that are procured from reliable vendors in the market. Our ranges of fitting are extensively used for fastening purposes. Clients can avail these from us at reasonable prices in the market. 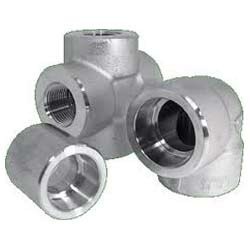 We are instrumental in offering a wide range of Forged Elbow 45 Degree to the esteemed customers. These elbows are made using high-grade stainless & carbon steel, in compliance with the international quality standards. The durable and defect-free range of products is extensively used to connect fractional tubes. Available in various sizes and grades, these elbows are used to cater to the needs of chemicals, fats & fertilizers, sugar mills and distilleries, among others. 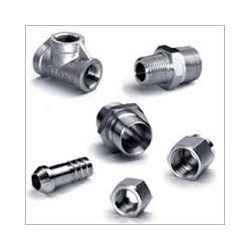 We are engaged in offering a high quality range of Forged Cap Fitting to the esteemed clients. These caps are made available to the clients in various sizes, dimensions and other specifications to meet clients' varied requirements in the best possible manner. Forged Caps are developed by hot dip galvanized, which increases their service life.